1. Brown the cut-up pieces of round steak. 2. Place the browned pieces in a pan and cover with water. Boil for 1 hr until tenderized, adding more water as needed. You can also add Beef Bouillon cubes to the water for more flavor. 3. Follow the remainder of the recipe as directed. Instant Read, Oven Proof, Microwave-Safe, and Thermocouple. For beef, insert the thermometer in the meat away from the fat, bone, and gristle. For hamburger, insert the thermometer at the thickest point. Cuts marked with * meet government standards for "lean" and are based on cooked servings with visible fat trimmed. 1. Cattlemen’s Beef Board and National Cattlemen’s Beef Association, "Antibiotic Use in Cattle Production," Utah Beef Council, http://www.utahbeef.org/thebeefstory.aspx. "Feeding cattle a grain-based ration for a small period of time helps improve meat quality and provide a more tender and juicy product for consumers." 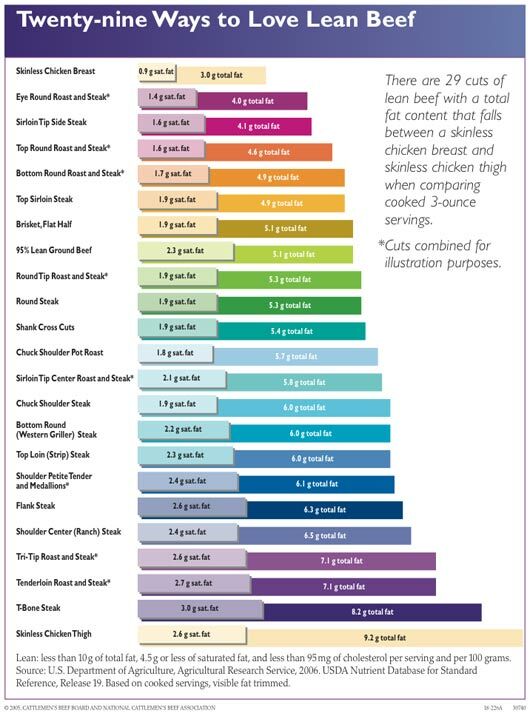 Taken from "Beef Choices" by The Beef Checkoff. Click here for the full .PDF File.